What IS Living Life 180? 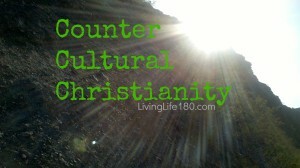 The best definition is this: Living Life 180 is Counter Cultural Christianity. If you want to be Living Life 180, it’s time to stop accepting what our culture tells us Christianity looks like. It’s not what the WORLD says, it’s about what the WORD says. Cultural Christianity is about identifying with a certain moral standard, Counter Cultural Christianity is about being a true follower of Christ. So what does Christianity look like in today’s culture? It’s a watered down Christianity. Culture tells us what we WANT to hear, not what is TRUTH. People show up at their Culturally-friendly church and given messages about how to live happy, wealthy, and wise. Culture’s version of Christianity hands out feel good messages, keeping hard to handle truth a secret. Prosperity preachers are teaching how to live in wealthy abundance. Cultural Christianity distorts the scriptures to define things as we want to hear them. They’re leaving out the fact that the abundant life that Jesus tells us can be ours is NOT defined through material wealth or what WE as human beings desire. Love only. Yes, God is loving, but is He ONLY loving? It’s important to understand that God is multifaceted. God’s love, mercy, and grace are incredibly important! But equally important is to understand that God is just. It’s a rules based Christianity. Be a good person – as long as I’m a good person, I’m probably good with God. Moral Relativism – I’m not perfect, but looking at others in society I’m relatively good. I’m not a murderer, molester, tax evader…so I’m good enough to make it to Heaven. Works based – Do certain things and you are going to heaven. All are going to heaven – God created all of us, so we’re all going to Heaven. All are called, all are chosen – it embraces all beliefs, all religions, no matter what. So why is this? Why has Culture made Christianity softer, harder, or thoughtless? A watered down gospel is soft. A rules based gospel is hard. A Universalistic gospel is thoughtless…after all, if EVERYONE is going to Heaven, what is there to think about? All of these types of Christianity have added to the Gospel. And according to the Bible, those who add to the Gospel are cursed! So if this is what Cultural Christianity looks like, what does Counter Cultural Christianity look like? Before we can really answer the question of Counter Cultural Christianity, we need to look to the Bible to look to the source: Christ. Christianity is about salvation and eternal life. That is where it starts. We can’t even TALK about our emotions, our abundance, our love, until we understand that we were dead in our sins but that Christ came to pay the way for us. How did he “pay” for our sins? Romans 3:23 – ALL have sinned. So none of us are WORTHY of salvation. Culture is sinful, because culture is ruled by the flesh not by the spirit. But God loves us and desires a relationship with us…so He provided a solution! So now we know that the MAIN purpose of Christianity is to enter into an eternal and loving relationship with almighty God. thin us. When that happens, we have the evidence of Him within…which is the fruit of the Spirit! And this TRUE Christianity DOES feel good! It feels better than ANYTHING that Culture has for us. What about prosperity and abundance…can Christians have it? Hmmm…consider it pure joy for suffering and trials? Sounds Counter Cultural to me! And if we go through these trials, we are left “lacking nothing.” What does lacking nothing mean? It means abundance! Abundance as God defines it, not as the world does. Culture gives us a rules based religion. What does Counter Cultural Christianity give us? We don’t do good works to GAIN our entry into heaven. It is BECAUSE we are saved that we do good works out of gratitude to a loving God! Our good works are the proof of salvation, not the way of salvation. No one is ever good enough. God’s not grading on a curve. Take a look at Mother Teresa – even SHE said she’s nowhere near good enough to get into heaven. Culture gives us a Universalistic Christianity. What does Counter Cultural Christianity give us? John 14:6 “I am the way the truth and the life, no one comes to the Father but by me.” We can’t add to the gospel! We can’t pour in other little pieces. Jesus is the KEY to salvation. Period end of story! Proverbs 16:25 reads, “There is a way that seems right to a man, but in the end it leads to death. Matthew 22:14 – Many are called, few are chosen. If we are seeking FIRST the kingdom of God, we will have joy, peace, abundance, love…because our view of these things are defined the way the Kingdom of God defines them! We are no longer chasing our selfish desires, but chasing God’s desires. Christ alone through faith alone, seeking first HIS Kingdom, and the evidence of salvation through the fruits of the Spirit. Counter Cultural Christianity…or as we like to call it, Living Life 180.